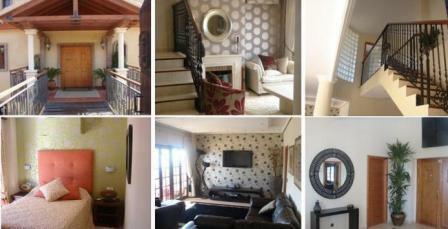 To Enquire about the Luxury La Paloma Villa CLICK HERE ! 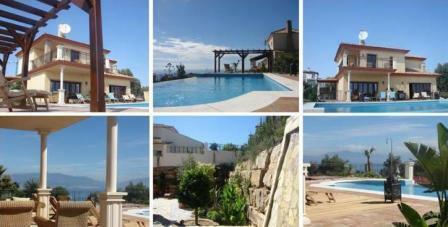 Our beautiful luxury villa on the Costa Del Sol is perfectly placed for a fantastic holiday near the unspoilt beaches. There are lots of things to do, so whether its sailing, fishing or maybe playing one of the world famous golf courses, the choices are almost endless. For the less energetic there is the option of just lazing by our infinity pool and jacuzzi followed by having lunch and engaging in some stylish shopping in Marbella old town. The villa has fantastic sea views to the north up the coastline to Marbella, and to the south the views are of Gibraltar and Morocco. The elevated position of the villa ensures privacy as well as welcome sea breezes in the summer months. The outside of the house comprises of a large infinity pool with Jacuzzi, a large covered terrace with sofas and open dining area which offers a tiled Morrocan table that sits eight people in comfort. There is also a large Weber gas barbecue and a wooden decking area complete with sun loungers. At the head of the infinity pool there is a large pergola, with covered chill bed, sun loungers and great views. Whilst in front of the pool area there is also a large stone built sundeck with a large stone chill bed and seating adjoining a small olive grove. The sunken gardens at the front of the house are very private and consist of an Andalucian style courtyard, with sofas in a covered seating area with lush gardens and peaceful waterfall. To Enquire about La Paloma Luxury Villa CLICK HERE ! The Villa in accessed through its large front wooden gates, over a bridge flanked on either side by a waterfall and lush sunken gardens.The accommodation consists of five bedrooms, all ensuite. There is a TV lounge, dining area, and a further luxurious separate lounge area on the ground floor. In the entrance hall there is a separate w/c and the study which has a large desk with captains chair, bookcases, drinks cabinet and wifi access. Four of the bedrooms are on the lower ground level. The fifth bedroom has a large leather sofa bed which can be either used as a large double bed, or a sofa to watch the large flat screen home cinema TV in the room, complete with Wii and PS2. The ensuite master bedroom on the top floor is accessed over a glass sided bridge and also has a walk in wardrobe area as well as a four poster bed. There is a feature glass wall and stunning views from its large external private terraces which ideal for sun bathing and watching the yachts and fishermen at sea. The kitchen is equipped with a large American fridge freezer giving chilled filtered water. There is a touch sensitive hob, oven and microwave oven. Everything you need to cook a perfect meal. There is also a raised terrace outside of the kitchen, excellect for having breakfast al fresco. Additional services include airport transfers, and maid and culinary services.